A CT scanner is a complex device that obtains large numbers of X-ray images from every point around numerous “slices” of a patient’s body. Complex algorithms are used to integrate the numerous images from the different vantage points into complete cross-sectional images of the patient’s body. 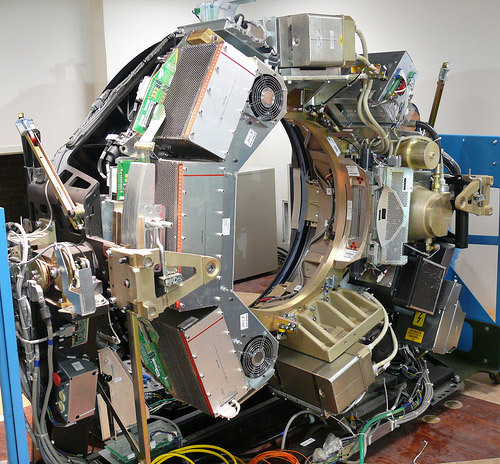 The ring-shaped gantry of a CT scanner contains technology for generating and receiving the X-rays that form the basis of a CT image. Primary among these elements are an X-ray tube and a detector which continuously rotate around the open center of the ring while remaining directly opposite each other. The X-ray detectors used in CT scanners are unusual in that they measure the attenuation of radiation caused by the interaction of the rays with the patient’s body, rather than measuring radiation directly. A heat exchanger prevents the x-ray tube from overheating. Power is delivered to the X-ray tube and detector via slip rings which eliminate the need for electrical cables, and thus facilitate their continuous unidirectional rotation within the gantry. The slip rings are powered by stationary “brushes” made of small metal blocks that are in contact with rotating conductors, forming an electrical connection. In some CT scanners, similar brushes also transmit data signals from the gantry controller to the slip rings. An autotransformer which can double the input voltage is used to generate the large amount of power required. 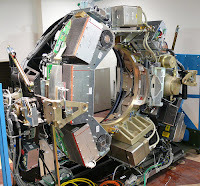 A powerful CT scanner computer collects and analyzes the data generated by the detector, using sophisticated reconstruction algorithms and computing thousands of simultaneous equations to reconstruct high quality images from the raw data. Because many of the calculations must be performed during the exam, the speed of the computer determines the duration of each scan. An operator console enables CT technicians and physicians to input scan parameters such as thickness of the slice, angle of the gantry and the position, and desired trajectory of the patient couch. A viewing console allows real-time viewing of CT images. Integrated software controls the scanning process. A variety of safety features, indicators and controls are integrated in the CT scanner to ensure that radiation levels do not exceed acceptable levels and that patients and technicians are not exposed to electric shock.